Because it generates improve profit for the business. In a recent piece of research (Research: 6 Key Drivers of Successful Customer Feedback Programs) we identified that organisations which implemented service recovery as part of their customer feedback process had a more successful overall process. Put simply, run the React Process and your customer feedback process works more effectively. Several of our clients have performed analysis on their customer data to identify the impact of service recovery. Each of them has found that this process substantially increases the life time value of their customers. In fact it has positive ROI, i.e. the value created is more than the cost of performing the process. This sounds simple but the first step is to have management decide that they will invest in this process. It is a decision that must initially be taken in the faith that it will generate value but one that will need to be validated later in the process. An active decision needs to be taken because you will need to allocate resources and planning to the process. Without management support those resources will not be forthcoming. In the short term it will cost money and time to implement. Those costs will look like incremental costs to the business so you need to get buy in to be able to implement. Run a process design workshop to create your React Process. Make sure that you have all of the right people in the room: customer service, operations, sales, etc. so that you can make decisions in the meeting and move quickly. In this approach you have one person or a small team responsible for receiving all of the consolidated requests for action or cases created from low scores in the feedback process. The team is then responsible for parsing these requests out to the correct people in the rest of the organisation. They are also responsible for following up to ensure that the case has been closed. Alternatively you can have the request directed straight into the applicable part of the organisation for action. In this case you need to have someone (or a group) responsible for catching the request and actioning it in the business. Of these two, Direct Action is the most efficient as you don’t need a coordinating group to manage the allocation of tasks. However, it is also the most difficult to implement. The key issue is how do you decide which piece of feedback to automatically direct to which group or person. Often it is easiest to set up the Triage process in the beginning and when the kinks are ironed out, you can move to the Direct Action approach. Whichever approach you take you need to close the loop with the customer quickly. Set some target times: one business day or perhaps same business day. Make sure that you make contact with the customer via their preferred channel (normally telephone or email) and let them know that you have heard them. Their first reaction will be shock that someone has even read their customer feedback form and even more shock that something is actually happening. After they get over the shock you can help them through whatever issue they have expressed. 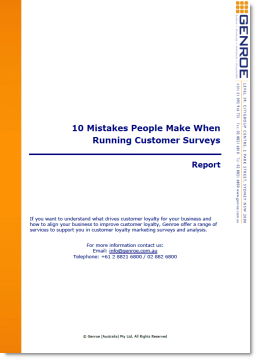 On average the result will be a happy customer who is probably more loyal than before they had the issue. Documenting the process is really just to set it into place in the organisation. Whatever you document has a much better chance of being followed day in and day out. It will also survive staff changes and holidays more effectively. After you have been running for a while, 3, 6 or 12 months analyse the data to identify the impact that you are having on customer value. This is a very important step. If you do, you should find that the React Process is actually driving Net Incremental Value to the business. At that point any resource constraints you have will disappear. In fact you might find management pushing you to expand the process. If you don’t sooner or later someone will ask what value this program is generating and it will get cut.